A few weeks ago i was sent a box full of goodies from the wonderful people at Liz Earle. I didnt want to rush out the reviews and wanted to take my time with using the products so i could review them properly. I have heard lots of things about Liz Earle products in the past, especially the infamous Cleanse & Polish but never ventured into buying so when i was offered the opportunity to test out some products i was excited to say the least. I will be reviewing each product over the next few weeks. Fill a basin with hand-hot water. Apply 1 or 2 pumps of Cleanse & Polish Hot Cloth Cleanser onto dry skin and use your fingertips to gently massage the cream over your face and neck. Work in circular movements from the centre of your face outwards. Massage over your eyelids and eyelashes last to avoid spreading eye makeup over your face. Rinse the pure muslin cloth in hand-hot water and wring it out so it's damp, not wet. Use the muslin cloth to wipe off the cream using a clean section for each part of your face. Place a single finger inside the cloth to thoroughly clean more awkward areas such as around the nose. Be gentle around your eye zone when removing eye make-up. Rinse the cloth thoroughly during cleansing. Rinse your skin in cool water and carefully pat dry using a soft towel. Rinse the muslin cloth thoroughly and allow it to air dry naturally. I have been using the Cleanse & Polish morning and night for approximately a month now and i can honestly say i am in love! This product feels amazing on the skin and makes cleansing and removing make up super easy! I have never before experienced using a muslin cloth in my skin care routine and now dont think i could do without! One pump is enough to cover the whole face and you gently massage in, this is the cleansing process. I found that it removed every trace of make up also, so there was no need for me to use face wipes or a separate eye make up remover which i would normally use. The product is a white cream which is rather thick, but applies to the face with ease, it also feels & smells amazing. To polish, you use the hot muslin cloth to wipe the product off. I honestly could see a difference to my skin after each use as it looked glowing and felt extremely soft! The muslin cloth worked wonders, was a gentle exfoliation of the skin without been too harsh. I was left with radiant & glowing skin after each use. My face felt exceptionally clean and felt amazingly soft & smooth! This will now become a staple of my skincare routine. I absolutely love my new skincare routine and would honestly recommend this product to everyone, im not sure how long my tube will last me but once i run out i will definitely carry on repurchasing this product! 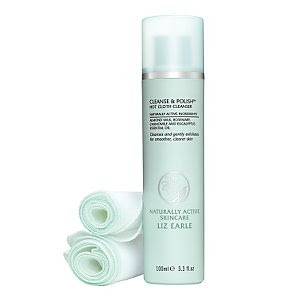 What are your thoughts on Liz Earle products? Have you tried any? I've never tried this but recently got some muslin cloths to take my cleanser off with and absolutely love it. It does make an amazing difference. I love how detailed this post is! Great blog! Would love to have you follow mine too! I won this product in a Marie Claire competition yonks ago and though I've not reviewed it, I can't express enough my love for the muslin cloth. That's what makes it for me, it feels like you're giving your face a proper clean. Fab! I've never heard of or used this line, but I no matter what cleanser I use, I use a hot face wash cloth to cleanse my face, nothing makes my skin happier!